Glyceraldehyde 3 Phosphate Dehydrogenase Activity Assay Kit (Colorimetric) (ab204732) provides a simple and sensitive method for monitoring GAPDH activity in various samples. In this assay, GAPDH catalyzes conversion of GAP into BPG and an intermediate, which reacts with a developer to form a colored product that absorbs maximally at 450 nm. Our high-throughput adaptable assay can detect GAPDH activity as low as 100 µU/mL in a variety of samples. GAPDH (Glyceraldehyde-3-Phosphate Dehydrogenase; EC 1.2.1.12) catalyzes the conversion of Glyceraldehyde-3-Phosphate (GAP) to 1, 3-Bisphosphate Glycerate (BPG) and plays a key role in glycolysis. The enzyme is involved in cellular processes such as apoptosis, membrane trafficking, iron metabolism and nuclear translocation. 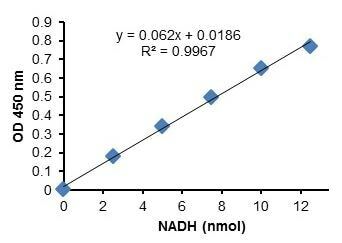 GAPDH (housekeeping gene) expression is stable and constitutive. Deregulation of GAPDH activity is associated with abnormal cell proliferation and carcinogenesis. Accurate quantitation of GAPDH activity is important for diagnosing diseases and studying normal cellular physiology. 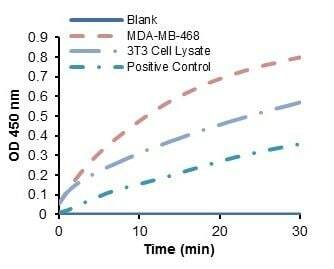 GAPDH activity in the Positive Control, 3T3 cells lysate and MDA-MB-468 cells lysate. 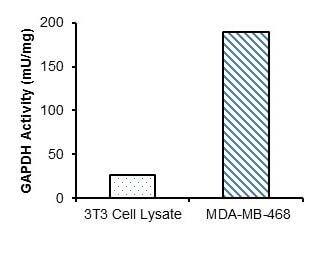 GAPDH specific activity calculated from 3T3 cell lysate (11.1 µg protein), and MDA-MB-468 cell lysate (2.76 µg protein). Publishing research using ab204732? Please let us know so that we can cite the reference in this datasheet. There are currently no Customer reviews or Questions for ab204732.